IMG_1041, originally uploaded by All Things Mimi. 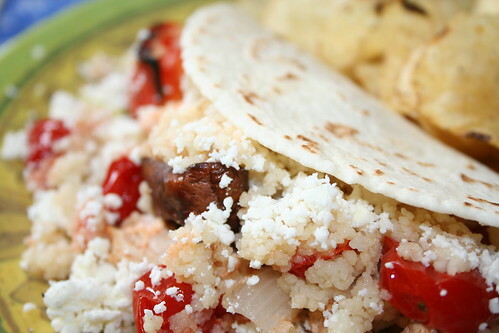 I had some chicken and onions, peppers, mushrooms and couscous left over from the red curry chicken kabobs last night, so this afternoon I heated the meat and veggies, made a spread out of Dev’s homemade yogurt and some greek seasoning, put that on a 6″ tortilla with the meat and veggies, added some feta cheese and a side of cracked black pepper potato chips. Not a bad lunch considering all the other projects we’ve got going on around here today…..